I have three collars. They’re all purple. And I have two feather boas, one purple and the other purple with a touch of gold. 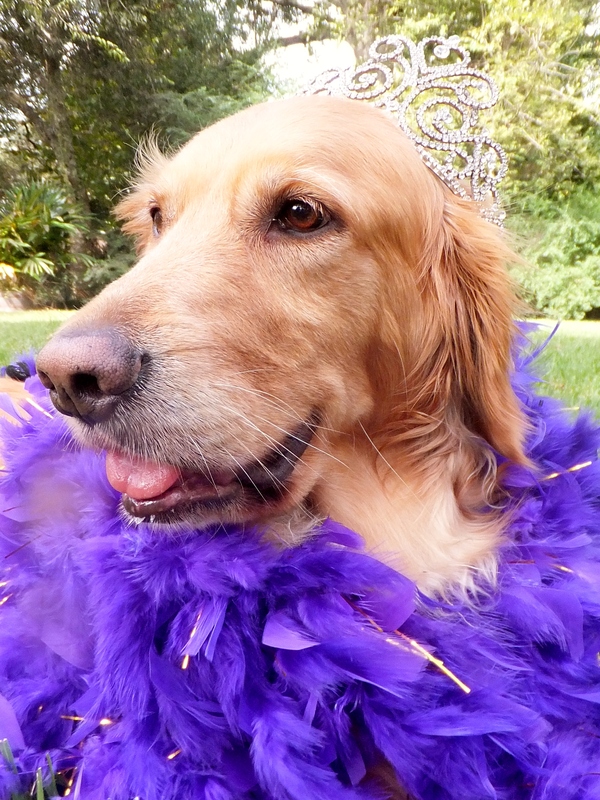 When I’m wearing my purple boas and my “diamond” tiara, I feel like a princess . . .
. . . the Princess of Purple. 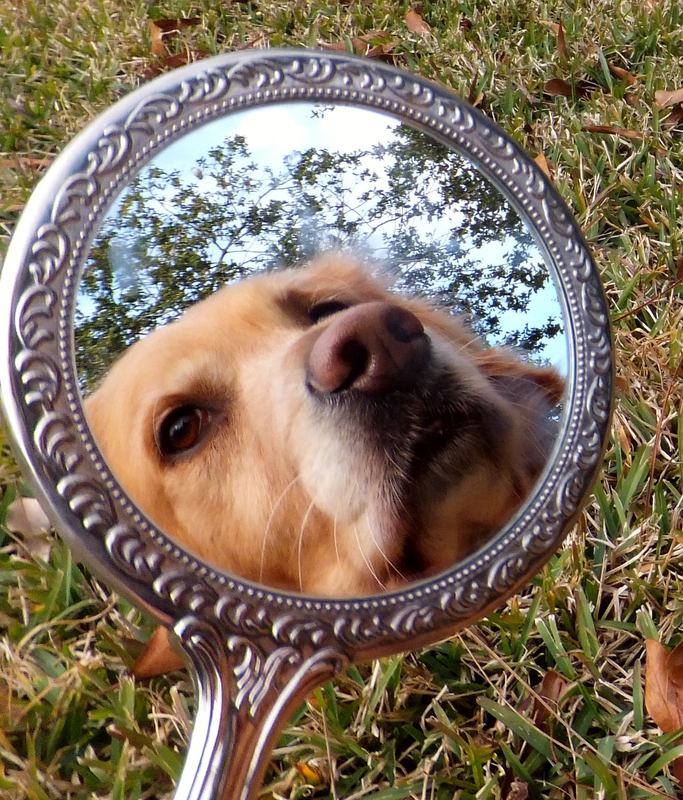 I’ve never been one of those dogs who is fascinated by his of her reflection in a mirror. We only have one mirror in our house that’s low enough for me to see myself. It’s in a room that I hardly ever enter, but even then I’m not terribly interested in looking at myself. 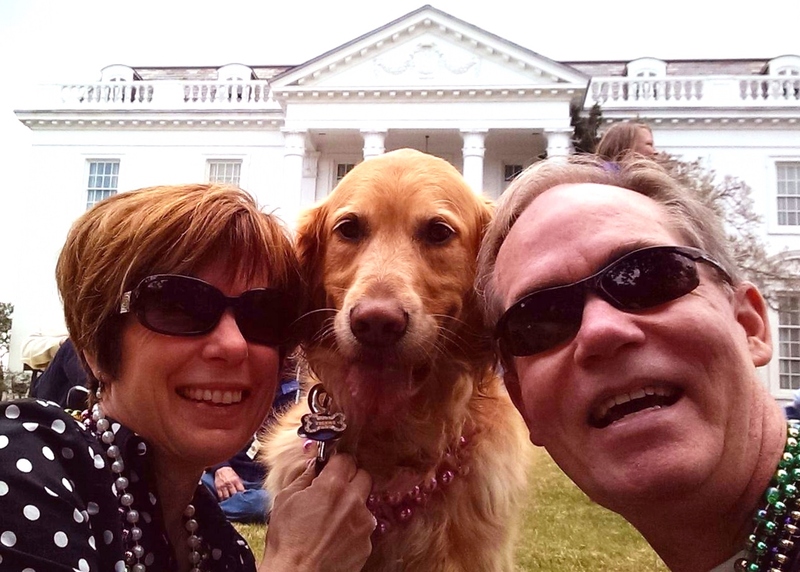 When I visit New Orleans with my humans, we often walk by the Louisiana Children’s Museum. There are a couple of those funhouse mirrors outside of the doors, and my human mommy is always trying to get me to look at myself. No luck . . . although Mommy is oddly excited about seeing her own distorted image. 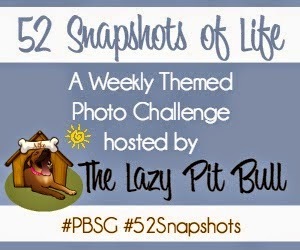 So you can imagine how much Mommy was not looking forward to trying to capture a photo for this week’s #52snapshots challenge. She thought about going all artsy and trying to get a photo of my world reflected in my eyes, but a late-afternoon cloudy sky didn’t help matters. So she went inside and grabbed the only handheld mirror that we own and hoped for the best. And that’s when I surprised her by showing at least a bit of interest in my reflection. I have to say I made my mommy very happy. Sometimes we dogs have to humor our humans. I was planning the perfect snapshot that would perfectly represent this week’s theme: love. Should I snap Harper Lee with a cherished toy? Or perhaps a favorite treat? Maybe I should get a photo of Miss Lee frolicking with one of her many canine loves? (Though not a floozy, little Miss Harper Lee does have lots and lots of boyfriends . . . in all sizes and ages.) I even thought about using an old image from an Instagram photo challenge more than a year ago–a black and white of Harper Lee’s paw in my hand taken to depict a similar theme: lots of love. My human mommy and I like to create together. We’ve created a whole lot of dog treats, a few fancy collars, and even a canine candy striper outfit. For this week’s photo challenge, we decided to create something new. Mommy turned to the Internet and searched “Dog Crafts.” There were lots of fun projects: toys made from sweaters, poo-poo bag pouches that attach to collars, collapsible bowls. 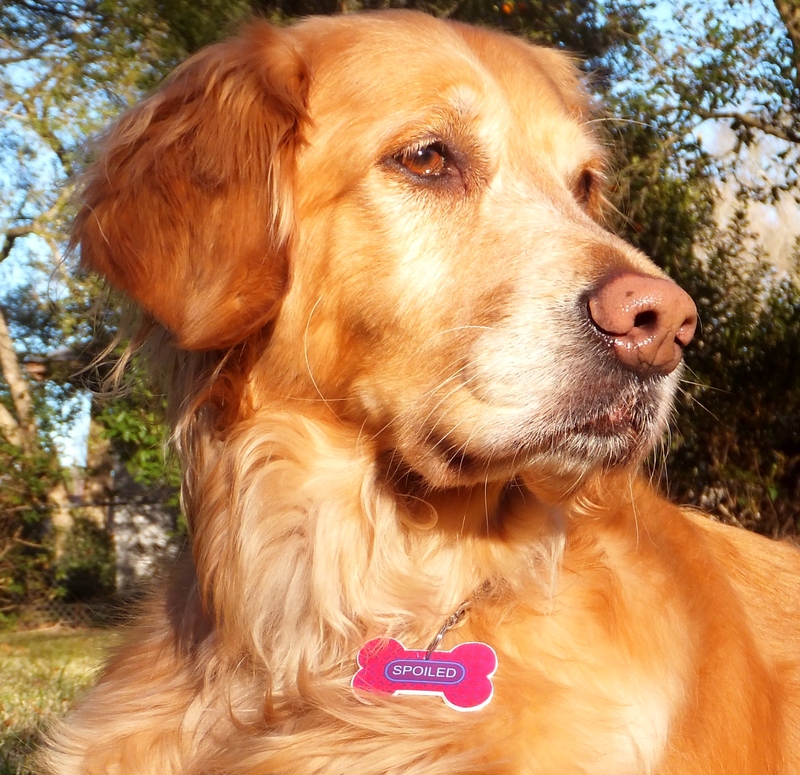 But we settled on creating dog tags using Shrinky Dinks, shrinkable plastic sheets that you run through the inkjet printer. A number of sites offered templates and directions, and the project was fairly simple . . . although we did have a few rejects. Mommy says this tag is perfect for me. I have no idea what she means. We decided to create a few extras for my friends. Apparently I’m not the only spoiled pup around. I have more than enough treats and an overflowing toy basket. But my dream come true would be a never-ending supply of sticks. 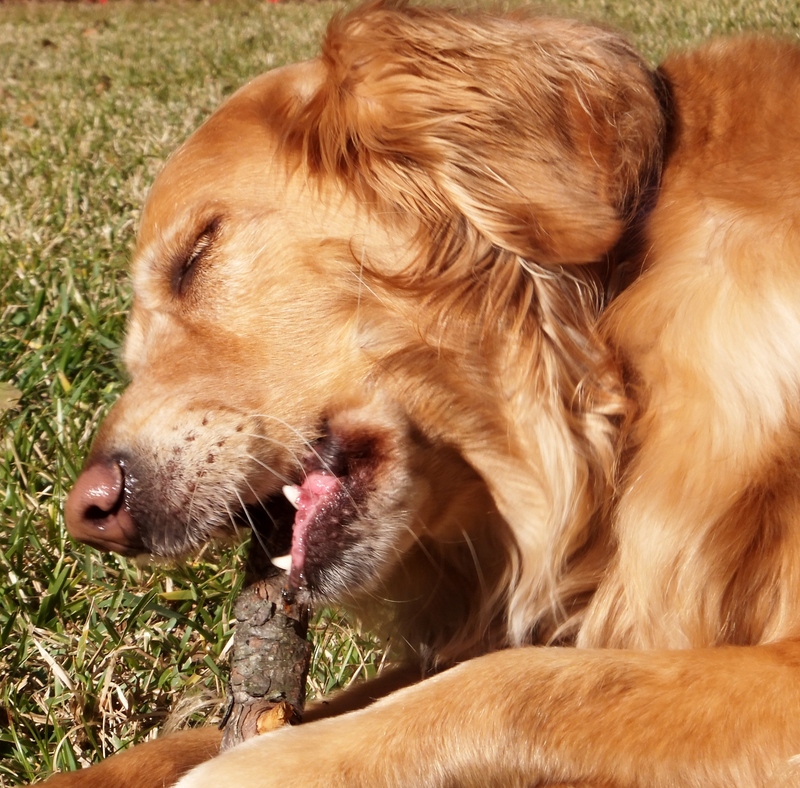 On a pretty day, there’s nothing better than sitting in my back yard and gnawing on a good stick. I think sticks are . . . dreamy. Sometimes life’s little joyous moments surprise you. 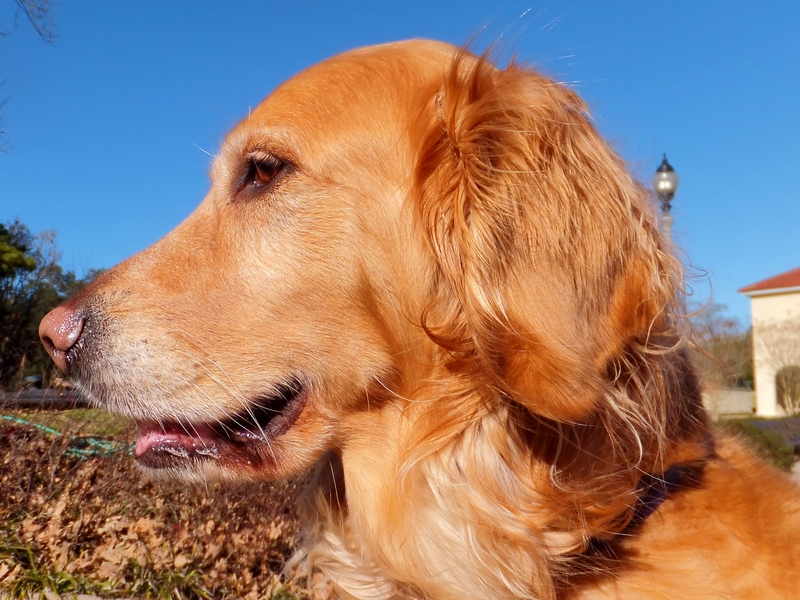 For this week’s challenge, I had planned to post a photo of Miss Harper Lee with that classic Golden Retriever smile. But then a funny thing happened. Harper Lee was outside with her human daddy doing a little grilling. 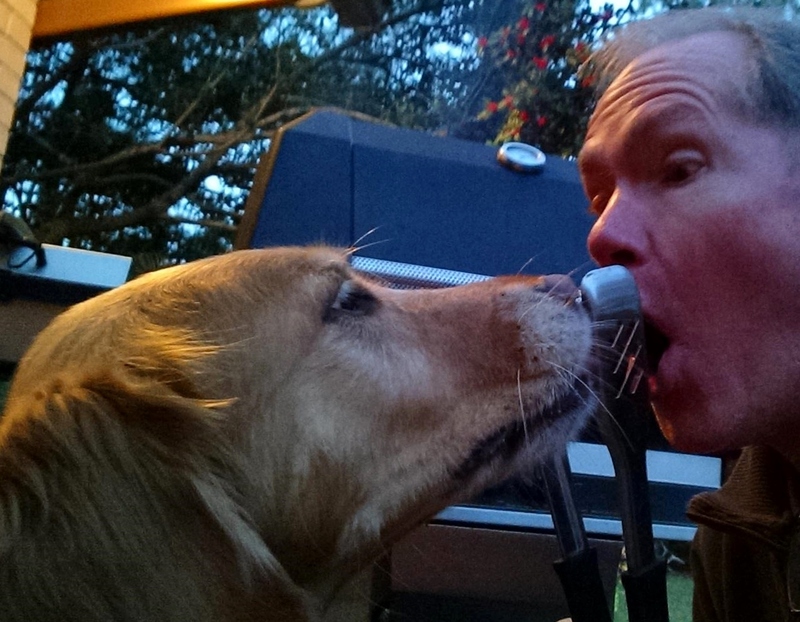 Harper Lee loves to grill with her daddy. They call it “grilling and chilling,” and it’s their special time. I was in the kitchen preparing the rest of our dinner. And that’s when I got a text and saw this photo: a selfie from my husband with his little girl. He captured such a special moment . . . a joyful moment . . . and my heart was full of joy. This photo reminded me that the best pictures aren’t those with perfect composition, or perfect lighting, or perfect focus. The best photos are those that capture perfectly joyful moments shared by those you love.